Following on from the addition of the Two Way Cache in my last post, I’ve made some more speed improvements to the Chameleon 64’s Minimig core. Firstly, I’ve added a single-word write buffer, which means when the CPU writes to Fast RAM it doesn’t have to wait for the write to complete. Provided completing the write takes priority over any potential reads from the same address, and the Cache is updated to reflect the new data, then the CPU can continue merrily processing. Secondly, I’ve added a second access slot to the SDRAM controller, which means in many cases the wait for RAM service is reduced from a worst-case 24 cycles to 17 cycles. The downside is that because RAM operations between the two access slots overlap, they can’t be to the same RAM bank. For this reason I’ve remapped the RAM so that bank 0 contains Chip RAM, Slow RAM, Kickstart ROM and OSD RAM, leaving banks 1-3 free for Fast RAM. 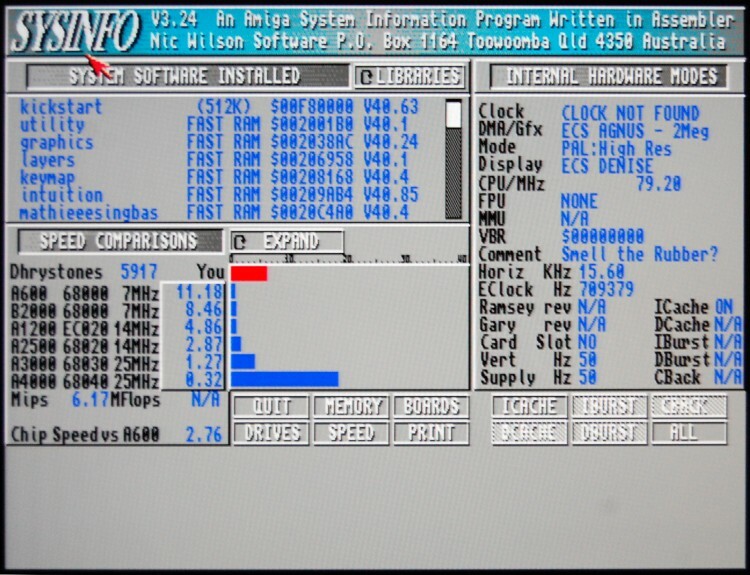 Chip RAM and Kickstart ROM accesses can thus now overlap with Fast RAM accesses. Finally, I’ve simplified the TG68 wrapper so that it no longer uses the enaWRreg signal to synchronize the CPU to the Amiga’s 28MHz clock. In my last post I said I was going to integrate the write cache into my two-way cache *before* adding it to the Minimig core – but I got impatient! I’ve *finally* found the subtle bug that was causing my two-way cache to fail. The symptom was that the boot process would appear to work fine, loading an S Record off the SD card, but having loaded it, the code would fail to start. It was as though the bootloader was ignoring the S9 record at the end of the firmware file.